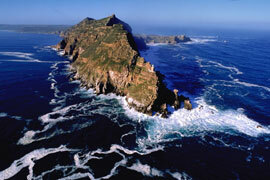 At the tip of the Cape Peninsula 60 km south-west of Cape Town, lies Cape Point, a nature reserve within the Table Mountain National Park; a declared Natural World Heritage Site. Encompassing 7 750 hectares of rich and varied flora and fauna; with an assortment of buck, baboons and Cape Mountain Zebra as well as over 250 species of birds, Cape Point is a nature enthusiast paradise. Want a beautiful view but really don’t have a lot of time? Take the Flying Dutchman funicular railway, it saves you a long walk up hill but allows you to see the old lighthouse and enjoy the panoramic views. 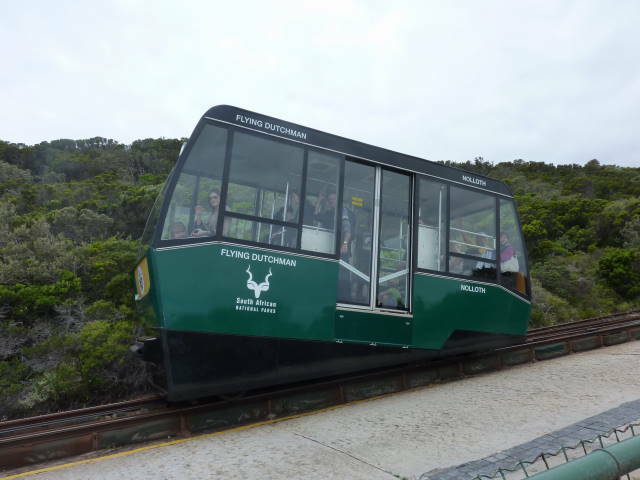 It is believed to be the only commercial funicular of its type in Africa, and takes its name from the local legend of the Flying Dutchman ghost ship. What is the Flying Dutchman you ask? Well I hate to disappoint the Pirates of the Caribbean fans, it does not have Orlando Bloom on board. It is a ghostly galleon that has been immortalised by mariners’ accounts and by a number of sightings over the past three-and-a-half centuries. As legend has it, she was captained by a Dutchman, Hendrik van der Decken, and was headed home from the modern day Jakarta to Holland in 1641. As Van der Decken approached the Cape, typically stormy weather shredded the ship’s sails and waves flooded the deck. The captain had rounded Cape Point on several occasions previously, but this time, a terrified crew implored him to turn back. He refused to submit to the elements and lashed himself to the wheel, swearing that he would sail around Cape Point, even if it took him until Doomsday. There are many different walks that you can do around Cape Point to many different ship wrecks, during the walk you can enjoy the extensive flora and fauna that Cape Point offers. Table Mountain National Park forms part of the Cape Floral Region, a World Heritage Site; with numerous beaches, dozens of amazing viewpoints, a fascinating maritime history, and plenty of unique fauna and flora, it’s impossible to fit everything that Cape Point has to offer in one visit. Photograph the more than 1 100 indigenous plant species that grow nowhere else in the world. Sample world-class cuisine and enjoy the most spectacular vistas over False Bay at the Two Oceans Restaurant or perhaps shop for curios and mementos at the three Cape Point shops. There are many marvelous things to do at Cape Point, walks to do, rocks to Abseil, but please remember that this is one of our most precious areas in Cape Town. Respect our Flora and Fauna cause you cannot get it anywhere else in the world.